Fargo has grown immensely and gone through numerous changes in its 142-year history. Growing from just over 2,500 people in 1880 to over 107,000 today and surviving such natural disasters as fires, floods and tornadoes; nothing has been able to stop Fargo from thriving. Fargo’s downtown has always been a thriving business mecca of the Red River Valley and is a key reason Fargo has survived to be the city it is today. Recently, the city of Fargo has begun to restore much of the historic downtown district located along Broadway and Main Street. The 1970’s were the birth of the “mall” as we know it today. Malls could be seen sprouting out of new developments in cities all across America. These malls drew businesses and shoppers away from downtowns into one central, indoor location. This spelled death for many downtowns across the nation. Fargo was no exception. 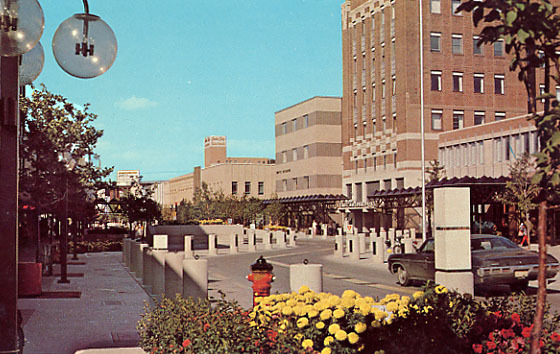 In the late 70’s, the Red River Mall was implemented on Broadway in an attempt to draw pedestrians to shop at downtown businesses after the opening of the West Acres Mall drew much of the business away from downtown. Broadway was realigned in a zigzag pattern to slow traffic and create a more pedestrian friendly environment. By the mid 1980’s many business owners were voicing their displeasure with the Red River Mall’s design. In 1986 the Mall was dismantled and Broadway was straightened. For much of the 1990’s and into the early 2000’s, downtown Fargo was a shell of its former glory days. 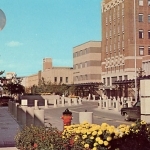 In 1999 the city of Fargo, realizing that its historic downtown was suffering, issued the “Fargo Renaissance Zone Plan.” With lucrative incentives (five-year tax exemptions and tax credits) given to property owners that invested in the rehabilitation of Fargo’s Renaissance Zone, downtown Fargo slowly began to thrive once again. Downtown Fargo is now a flourishing mix of residential and commercial buildings. Many of the buildings in downtown Fargo date back to the rebuilding of Fargo after the fire of 1893. The 600 block of Main Avenue is the only block of buildings that survived the fire. All of the landmark buildings have gone through some sort of renovation or name change in their history. Hotel Bison and the Fargoan Hotel are no longer hotels. They now house commercial spaces on the street level and residential living spaces on the upper floors. The Ford Building is no longer assembling cars; it houses commercial spaces and high-end residential condos. Many of the buildings have always housed businesses of some sort. Yet very few of these buildings have remained the same throughout the years. The Merchants National Bank building is now the King House Buffet, and the First National Bank building is now a bar fittingly called Fort Knox. Two of the most iconic buildings in downtown Fargo that have stood the test of time are the Hotel Donaldson, locally known as the HoDo, and the Fargo Theater. The Hodo was built in 1894 to serve as a meeting hall for the International Order of Odd Fellows. As one of the first buildings built after the fire, the building is a constant reminder of where Fargo came from. In the mid-1910’s, the building officially became the Hotel Donaldson. It has had its rough patches throughout the years, changing ownership and purpose many times, but the heart of the building and its history has survived. The Fargo Theater was built in 1926 as a cinema and vaudeville theater. Originally designed in the Renaissance style, the theater was restored in the 80’s with a more art deco style interior. The Fargo Theater still stands at its original location in downtown Fargo and is a major attraction to this day. Downtown is once again a must see for anyone visiting Fargo. From its vibrant beginnings, surviving disaster, and period of rough times, downtown Fargo has risen to new heights. The Fargo Street Fair every summer (the largest outdoor event in North Dakota) and Cruisin’ Broadway have become staples of downtown Fargo’s thriving resurgence.